Vaccinia virus employs multiple mechanisms to evade the immune system, yet is highly immunogenic. We studied the interaction between vaccinia and human dendritic cells (DCs), potent APCs. DCs develop from precursor cells in two stages: an immature stage in which Ag uptake and processing occur, and a mature stage in which there is up-regulation of costimulatory and HLA molecules and efficient T cell activation. Vaccinia virus undergoes an abortive replication in both stages of DCs and induces apoptotic cell death. Furthermore, maturation of immature DCs and consequently T cell activation are inhibited. Obstruction of DC maturation may constitute a novel mechanism by which vaccinia attempts to evade the immune response. Vaccinia virus, the prototype poxvirus, is highly immunogenic and has been successfully used as a vaccine to eradicate smallpox. Vaccinia vectors form the basis of many recombinant vaccines due to their broad host range, accommodation of large amounts of foreign DNA, induction of humoral and cellular immunity, and thermostability when freeze dried (1, 2, 3). Although vaccinia induces strong humoral and cellular immune responses, it remains unclear how these develop because poxviruses also employ many mechanisms to evade the immune system (reviewed in Refs. 4 and 5). We speculated that access to dendritic cells (DCs)3 in vivo may be critical for vaccinia and other poxviruses to elicit potent immune responses. DCs are potent APCs that activate CD4+ and CD8+ T lymphocytes and do so in small numbers (6, 7, 8, 9, 10, 11). Traditionally, vaccinia is delivered by scarification, and local epidermal DCs (Langerhans cells) in the skin may provide a vehicle to traffic vaccinia to draining lymph nodes. In the skin and in most tissues, DCs exist as immature cells, expressing low levels of MHC and costimulator molecules such as CD86. In this stage, DCs are equipped to acquire Ags via phagocytosis, macropinocytosis, and receptor-mediated endocytosis. After Ag acquisition, immature DCs are induced to migrate to the lymph nodes and undergo maturation. Maturation entails the down-regulation of Ag-acquiring and Ag-processing properties and the up-regulation of MHC and costimulator molecules to activate Ag-specific T cells (12, 13, 14). In this study, we analyzed human DCs for the ability to support vaccinia infection and replication. Our results indicate that vaccinia abortively infects DCs, blocks their maturation, and induces delayed apoptosis. These data suggest new mechanisms by which vaccinia may evade the immune response. RPMI 1640 with 10 mM HEPES, 5 mM l-glutamine, 20 μg/ml gentamicin supplemented with 1% human plasma, 5% heat-inactivated human serum, or 10% FCS was used throughout these studies. PBMCs were prepared from buffy coat fractions by isolation over Ficoll-Hypaque (Pharmacia, Upjohn, Kalamazoo, MI), and separated into T cell-enriched or T cell-depleted fractions by rosetting with SRBC (15, 16). Immature DCs were derived from monocyte-enriched T cell-depleted fractions by plating in complete medium containing 1% human plasma for 6 to 8 days supplemented with 1000 U/ml of human rIL-4 (Schering-Plough, Madison, NJ) and 1000 U/ml of human rGM-CSF (Immunex, Seattle, WA). Mature DCs were generated by transferring the nonadherent cell fraction to new plates on day 6 to 8 and incubation for 1 to 2 days in monocyte-conditioned medium (50% v/v), as previously described (15, 16). B-lymphoblastoid cell lines (B-LCL) were generated from PBMC by transformation with EBV supernatants, and maintained in RPMI containing 10% FCS (R10). The following recombinant WR vaccinia viruses were used: vP1170 parental vector, and vP1287, vP1288, vP1218-containing HIV-gag, pol and nef encoding genes, respectively, provided by Drs. James Tartaglia and William I. Cox (Virogenetics, Troy, NY). APCs were brought up to 1 × 107 cells/ml and infected with vaccinia stocks at MOIs of 1–2.5 in 0.1–0.3 ml for 1 h at 37°C. Following infection, cells were washed twice and cultured at 0.3 × 106 cells/ml in 1-ml vol in 24-well plates. The VV1-4G9, VV1-2F10, and VV1-6B6 anti-vaccinia mAbs reacting with the proteins D8L, A56R, and an early 29-kDa protein were kindly provided by Dr. Alan Schmaljohn (USAMRIID, Frederick, MD). The mAbs 183 against HIV p24 protein and to the lysosomal DC-LAMP were kindly provided by Dr. Melissa Pope (The Rockefeller University, New York, NY) and Dr. Serge Lebecque (Schering-Plough), respectively. HLA-DR-PE, CD25-PE, and isotype controls were purchased from Becton Dickinson (San Jose, CA), CD86-PE from PharMingen (San Diego, CA), and CD83 from Coulter (Palo Alto, CA). PE-conjugated goat anti-mouse IgG (Sigma Biosciences) was used as a secondary reagent. Cells were phenotyped with the panel of mAbs, fixed in 1% formaldehyde, and analyzed on a FACScan. Cells were fixed with 4% paraformaldehyde and permeabilized with 1% saponin, as previously described (17). Cells were exposed to primary Abs and secondary reagent for 30 min and analyzed on a FACScan. The percentage of viable cells was assessed by trypan blue exclusion. Apoptosis and necrosis were assessed by staining with FITC-annexin V/propidium iodide (PI) using the Early Apoptosis detection kit (Kamiya Biomedical, Thousand Oaks, CA), according to the manufacturer’s instructions. The allogeneic MLR was used to monitor DC function. DCs were added in graded doses to 2 × 105 allogeneic T cells in 96-well flat-bottom plates (Costar, Cambridge, MA) in triplicate. Proliferation was determined on day 5 with the addition of 4 μCi/ml of [3H]TdR for 12–16 h (mean cpm). In the superantigen-dependent T cell proliferation assays, graded doses of DCs were added to syngeneic T cells in the presence of 0.01–0.1 ng/ml of staphylococcal enterotoxin A. Proliferation was determined as above on day 3. Vaccinia is highly cytopathic in several cells (4). We therefore analyzed immature and mature DCs for cytopathic effects following infection with vaccinia. Immature DCs were generated from T cell-depleted blood mononuclear cells by incubation with GM-CSF and IL-4 for 6 to 8 days (15). They were induced to mature by the addition of 50% (v/v) monocyte-conditioned medium (MCM) for 1 to 2 days. Mature DCs can be distinguished by high levels of MHC and costimulatory molecules, the DC-restricted markers CD83 and DC-LAMP, and strong immunostimulatory activity (reviewed in Ref. 14). DCs were infected at MOIs of 1–2. Following infection, immature DCs were exposed to MCM immediately. Cells were analyzed for viability for up to 3 days after infection. After 1 day of infection, the mean percentage of viable immature DCs was 73%, as measured by trypan blue exclusion, and 84% in the case of uninfected cells (Fig. 1⇓, A and B). For mature DCs, the mean percentages were 92% and 84% for uninfected and infected cells, respectively. At later time points, however, vaccinia-infected immature DCs died at higher rates when compared with mature DCs. Three days after vaccinia infection, the viability in immature DCs dropped from 76% to 46% (Fig. 1⇓A). Vaccinia-infected monocytes and immature DCs that were not exposed to MCM showed a similar decrease in viability (40–50% viable cells on day 3 postinfection). Viability of DCs after vaccinia infection. The percentage of live cells as determined by trypan blue exclusion is shown in various DC populations at different time points after infection. A, Immature DCs + MCM. B, Mature DCs. The mean and SD of four experiments are shown. The absence of significant cell death at 1 day postinfection was also confirmed by PI staining (not shown). The mature DCs were more refractory to the cytopathic effects of infection. At 3 days postinfection, the viability was 77% and 70% for the uninfected and infected cells, respectively, and no significant differences in cell recovery were noted (Fig. 1⇑B). From a total of eight experiments, we determined that vaccinia infection of immature DCs led to 21–30% reduction in viability compared with only 7–11% reduction in mature DCs. Therefore, immature DCs and monocytes are more susceptible than mature DCs to the cytopathic effects of vaccinia. To determine whether immature DCs infected with vaccinia were dying via apoptosis, we stained DCs with FITC-annexin V, which binds to phosphatidylserine on the surface of cells undergoing early apoptosis (18, 19). After 1 day of infection, no significant differences were noted between uninfected and infected DCs. 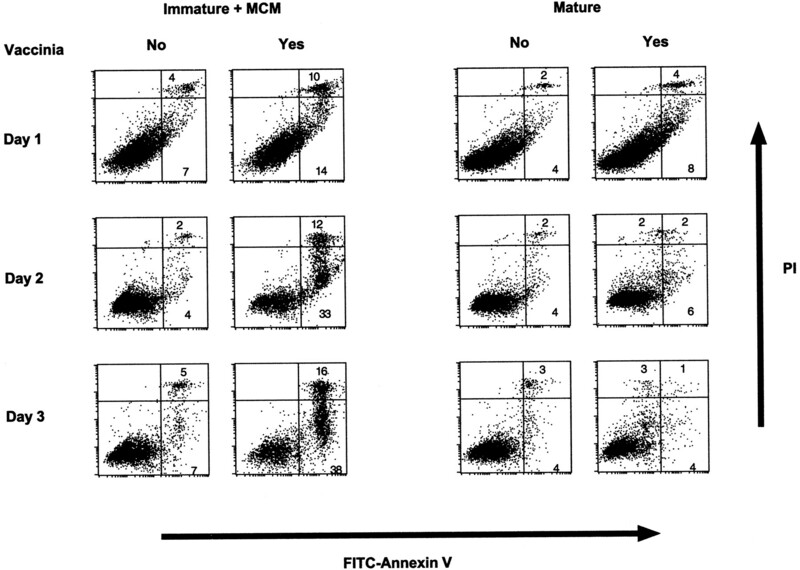 By day 2, a significant number of apoptotic cells (33% Annexin V+, PI−) and cells undergoing secondary necrosis (12% Annexin V+ and PI+) were apparent in the immature DC population (Fig. 2⇓), coincident with the time when viability drops by trypan blue exclusion (Fig. 1⇑). By day 3, more than half the DCs had undergone apoptosis and secondary necrosis. In contrast, mature DCs were largely resistant to the induction of apoptosis by vaccinia virus (Fig. 2⇓, right panels). The data indicate that vaccinia causes substantial cytopathic effects due to apoptosis in immature DCs, albeit delayed. Immature DCs infected with vaccinia die by delayed apoptosis. Immature and mature DCs were uninfected or infected with vaccinia (MOI 2). Immature DCs were cultured with MCM immediately following infection. At multiple time points after infection, the extent of apoptosis and necrosis was determined by staining the cells with FITC-annexin V and PI. Results shown are representative of four experiments. We next followed the life cycle of vaccinia in DCs and other APCs. mAbs reacting with early and late proteins were used to assess the vaccinia replication cycle in infected cells (4). The VV1-6B6 Ab detects an early intracellular protein of 29 kDa. The VV1-4G9 Ab reacts with the hemagglutinin protein (A56R), a late protein found on the surface of the extracellular virions, but also on the membranes of productively infected cells (4, 20). The VV1-2F10 Ab detects D8L, a late protein found on the surface of the intracellular immature virions, and the surfaces of productively infected cells (21, 22). One day after vaccinia infection, the majority of B-LCLs expressed the 29-kDa early Ag, the hemagglutinin, and the D8L protein (Fig. 3⇓), confirming earlier data regarding the permissiveness for vaccinia (23). Although few DCs expressed late cycle Ags, they did express the early cycle 29-kDa Ag (see arrows, Fig. 3⇓). Thirty-five percent of mature DCs (range 22–46%, n = 3) and 67% of immature DCs (range 50–85%, n = 5) expressed the 29-kDa Ag, demonstrating that the mature DCs are more resistant to infection, a feature that correlates with the reduced cytopathic effects (Fig. 1⇑). Similar data were obtained regardless of the types of recombinant vaccinia used. Vaccinia infection in DCs undergoes abortive replication. B-LCL, immature DCs, and mature DCs were infected with vaccinia (MOI 1). Immature DCs were cultured with MCM immediately following infection. One day after infection, the cells were permeabilized and analyzed by FACS with a panel of anti-vaccinia Abs: VV1-6B6 detects an early intracellular 29-kDa protein; VV1-4G9 detects the late vaccinia hemagglutinin; VV1-2F10 reacts with the late D8L surface Ag. Results are representative of five experiments for immature DCs and three experiments for mature DCs and B-LCLs. Monocytes resembled DCs in the expression of early but not late Ags (not shown). In all APCs, the 29-kDa early Ag was detected 3–4 h after infection and gradually accumulated over 24 h. Although vaccinia-infected B-LCLs transmitted virus to uninfected B-LCLs, infected DCs did not transmit infectious virions (not shown). 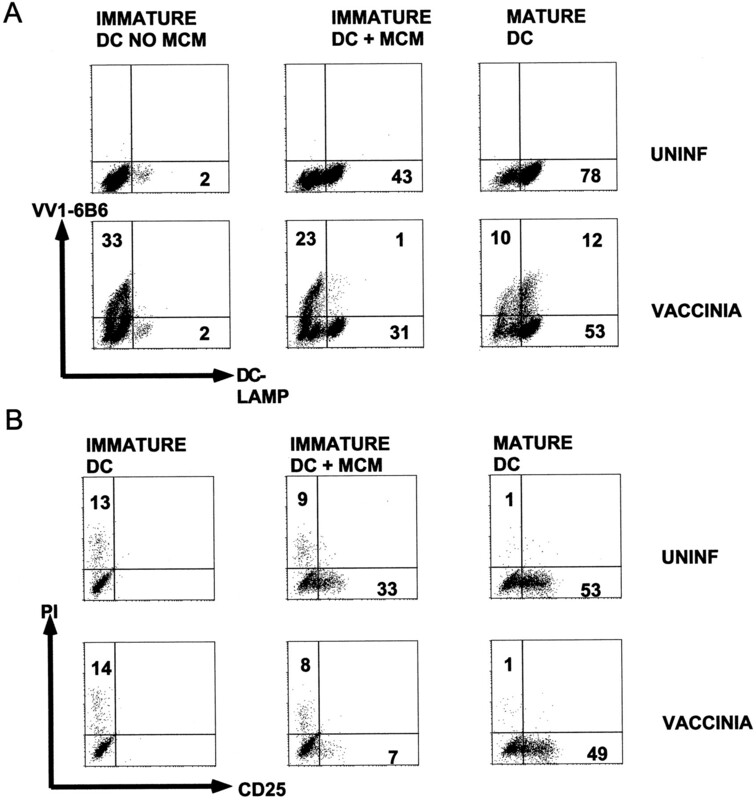 These data indicate that the replication of vaccinia virus in DCs and monocytes is abortive, but permissive in B-LCLs. Influenza infection of immature DCs induces maturation in the absence of additional factors (24) (data not shown). We therefore examined the effects of vaccinia infection on the maturation of DCs. Three populations were analyzed: immature DCs, immature DCs that were exposed to MCM following infection, and mature DCs. Surprisingly, we found that vaccinia inhibited the expression of many proteins known to be induced during DC maturation, including CD83, a marker of DC maturation, CD86, DR, and CD25 (Fig. 4⇓). The inhibition was most marked in immature DCs that were infected and then exposed to MCM, but a similar pattern was seen in the immature DC population to which no MCM was added after infection. In the later case, the effects were probably in a minor contaminating population of maturing DCs. On the other hand, mature DCs were much less affected by vaccinia infection. CD83 and CD86 expression were slightly inhibited, but CD25 and DR levels were not affected. The partial effect on mature DCs would appear to correlate with their lesser susceptibility to infection. Vaccinia infection interferes with DC maturation. Immature DC (no MCM), immature DCs + MCM (infected before MCM addition), and mature DCs were infected with vaccinia at MOI of 1. After 1 day of infection, the cells were permeabilized and stained for molecules known to increase during maturation of DCs. CD25 was not expressed in the immature DC (no MCM) population, and is therefore not shown. Results are representative of 13 experiments for CD83, 7 experiments for CD25, 6 experiments for CD86, and 4 experiments for DR.
Because the effects of vaccinia could have been the direct result of infection or an indirect consequence of the infected cell, we double stained infected populations of DCs with Abs to DC-LAMP and the 29-kDa early Ag (VV1-6B6). DC-LAMP is a recently cloned lysosomal protein, and unlike other markers, the Ab against DC-LAMP specifically stains mature DCs intracellularly (25). As expected, very few cells in the immature DC population expressed DC-LAMP (2%), and all of the infected cells were immature DCs (33% VV1-6B6+, DC-LAMP−) (Fig. 5⇓A). When MCM was added to infected immature DCs, only the fraction that did not express viral Ag was able to proceed to maturation (31% VV1-6B6−, DC-LAMP+]. In fact, of the total infected cell population (24% of total cells), only 4% were VV1-6B6+, DC-LAMP+ (1% of total cells), whereas 96% were VV1-6B6+, DC-LAMP− (23% of total cells). Thus, 96% of the infected (VV1-6B6+) cells actually failed to proceed to maturation (Fig. 5⇓A). Vaccinia blocks maturation only in the DCs that are infected and before killing the cell. A, Different populations of DCs were uninfected or infected with vaccinia MOI 2 for 1 day, stained with mAbs to vaccinia-specific Ab VV1-6B6 and the intracellular maturation marker DC-LAMP, and analyzed by FACScan. In this experiment, the percentage of CD83+ cells correlated with the percentage of DC-LAMP+ cells. Experiment representative of nine experiments. B, Different populations of DCs were uninfected or infected with vaccinia, MOI 1, for 1 day and analyzed by FACS after double staining with PI and CD25. The experiment shown is representative of three experiments. 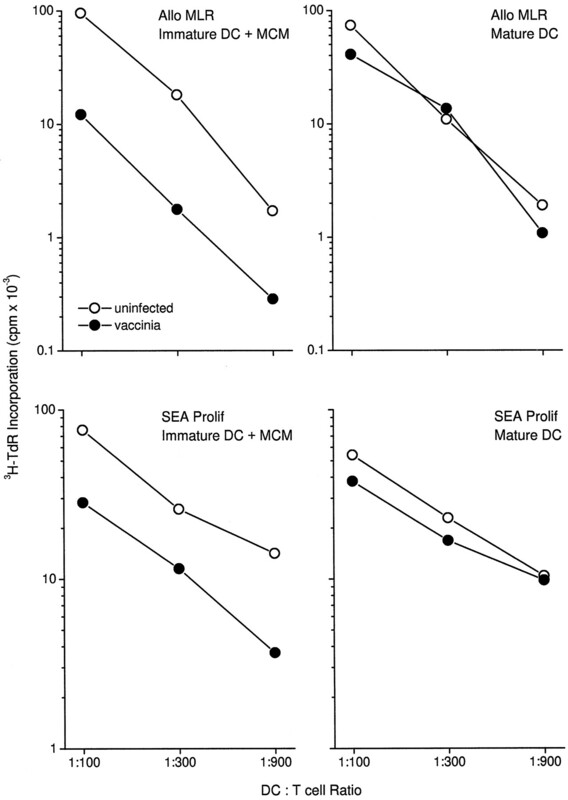 These results indicate that the infected immature DCs were unable to mature upon addition of the MCM stimulus, as indicated by the absence of a double-positive population. Other known maturation stimuli such as LPS and PGE2/TNF-α gave similar results (not shown). Thus, inhibition of maturation is a direct consequence of vaccinia infection. In contrast to immature DC populations, there was a significant population of VV1-6B6+/DC-LAMP+ cells in infected mature DCs. In general, however, ∼2-fold more immature DC-LAMP-negative DCs were infected (mean 43%, range 21–64%, n = 9) as compared with mature DC-LAMP+ DCs (mean 17%, range 8–35%, n = 6). To ascertain that infection blocks maturation before cell death, we performed double labeling experiments. DC markers were viewed in conjunction with PI staining. As Fig. 5⇑B shows, infected immature DCs exposed to MCM for 1 day showed a greater than 4-fold inhibition in the up-regulation of CD25, a maturation marker, without an increase in PI staining compared with uninfected cells. As previously shown (Fig. 4⇑), mature DCs retained CD25 expression. Because of the effects of vaccinia on DC viability and maturation, we assessed DC function in the allogeneic MLR. Mature DCs are the most powerful stimulators of T cell proliferation in this assay. Vaccinia-infected immature DCs that were exposed to MCM were markedly impaired in their stimulatory capacity (percentage of inhibition ranged from 82–91% at DC:T cell ratios of 1:100–1:900). Infected mature DCs were also less stimulatory, but the degree of inhibition was far less impressive (range of 0–45% inhibition at DC:T cell ratios of 1:100–1:900) (Fig. 6⇓, upper panel). 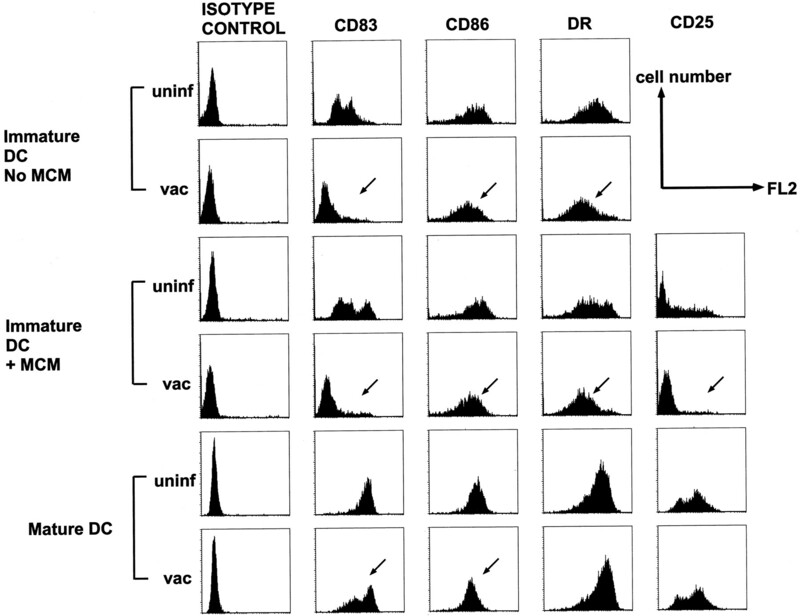 Similar results were observed in other assays of DC function, e.g., superantigen-dependent T cell proliferation, in which inhibition induced by infected immature DCs was 62–73% vs 3–30% by mature DCs at DC:T cell ratios of 1:100–1:900 (Fig. 6⇓, lower panel). The loss of function in immature DCs is presumably due to a combination of DC death and inhibition of maturation. Given that mature DCs are far less affected both with respect to viability and down-regulation of costimulatory molecules, it is not surprising that their function is less compromised. Vaccinia infection impairs the stimulatory capacity of immature DCs. Upper panel, Immature or mature DCs were infected with vaccinia virus, MOI 2. MCM was added to the immature DCs after pulsing with virus. After 2 days of infection, graded doses of APCs were cultured with allogeneic T cells, and [3H]thymidine incorporation was measured after 5 days of coculture. Uninfected APCs served as negative controls. The mean and SD of triplicates are displayed. Results are representative of four experiments. Inhibition of stimulatory activity was also observed when APC-T cell cocultures were initiated at 0 or 1 day postinfection. Lower panel, After 1 day of vaccinia infection, graded doses of DCs were added to syngeneic T cells in the presence of 0.1 ng/ml of staphylococcal enterotoxin A. Proliferation was measured as above after 3 days of coculture. Poxviruses use a multitude of mechanisms to evade the immune response. For example, they encode receptor homologues of IL-1β, TNF-α, IFN-α,β, and IFN-γ and inhibitors of the IFN transduction pathway (4, 5). Our studies identify a novel mechanism by which vaccinia can evade the immune response. Vaccinia inhibits DC maturation within 1 day of infection (Figs. 4⇑ and 5⇑). Infection in DCs is also characterized by abortive replication and induction of apoptosis (Figs. 2⇑ and 3⇑). The effects are most pronounced in immature DCs, which are more susceptible to vaccinia infection. As far as we are aware, this is the first example of a viral pathogen that interferes with DC maturation. While this study was under review, two other reports appeared describing the inhibition of DC maturation by protozoans. Plasmodium falciparum, the malaria parasite, infects erythrocytes and induces the expression of surface PfEMP-1 Ag. The modified erythrocytes bind immature DCs and inhibit their maturation and function upon exposure to LPS (26). In another study, Trypanosoma cruzi was found to produce soluble factors that prevent DC maturation (27). In contrast to these reports and our findings, other pathogens are known to induce DC maturation following uptake, e.g., influenza virus (13, 14, 24, 28). The advantage to the host in the latter case is that Ag acquisition and processing of microbial Ags are followed by efficient T cell stimulation. By inhibiting the maturation pathway of DCs, and inducing their death, vaccinia can subvert the development of efficient antiviral T cell immunity (Fig. 6⇑). Pathologic poxviruses, e.g., smallpox, may employ such mechanisms in their arsenal of immune evasion tactics. How might vaccinia inhibit maturation? MCM, the DC maturation stimulus used in this study, contains IFN-α, TNF-α, and IL-1β, which are key cytokines in the induction of DC maturation (12, 13, 16, 29). Production of cytokine receptor homologues in the early cycle by vaccinia, e.g., for IFN-α, may account in part for the block in DC maturation. Interestingly, the orf poxvirus encodes a functional factor that inhibits the activity of GM-CSF (30), which is requisite for generating DCs from hemopoietic progenitors in culture (14). Another consequence of vaccinia infection in DCs is an abortive replication. 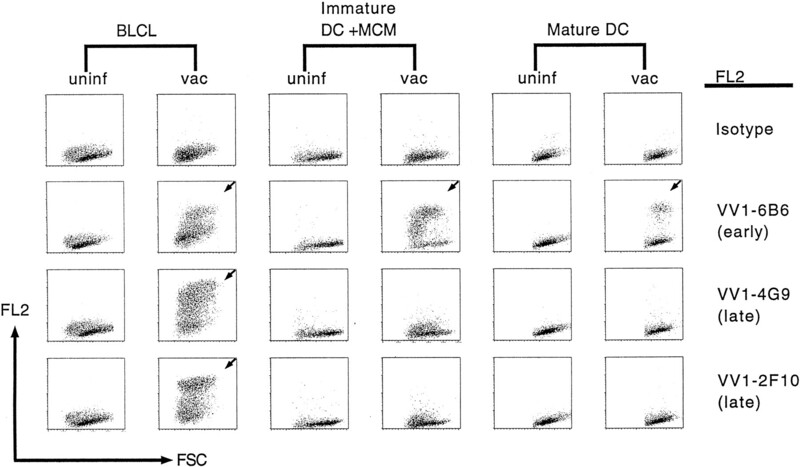 Immature and mature human DCs, as well as monocytes, permit the expression of early but not late cycle vaccinia proteins. Our findings are in agreement with studies showing that murine and human macrophages supported the expression of vaccinia early but not late proteins (31, 32), while murine and human DCs transcribed a reporter gene under the control of a vaccinia early promoter, but not a late promoter (23). The block in vaccinia viral replication in DCs is not understood at this time. However, resistance to infection or inhibition of viral replication in mature DCs, at least, is beginning to emerge as a common theme. For example, mature DCs do not support influenza replication, yet still efficiently present influenza Ags to T cells (17, 33). HIV replication is also blocked in mature DCs, yet the DCs can still transmit virus to T cells (34, 35). Mature DCs may acquire mechanisms that inhibit virus entry or infection. An antiviral state may be conferred as a consequence of maturation by type I IFNs, e.g., IFN-α (16, 29). IFNs induce the expression of the Mx proteins, the serine/threonine protein kinase, PKR, and 2′-5′ oligoadenylate synthetase (2-5A), all of which inhibit viral replication (36, 37). In fact, a protein with 2′-5′ oligoadenylate-synthesizing activity was recently described in maturing DCs (38). On the other hand, if vaccinia infects the DC before maturation, synthesis of early viral proteins, e.g., E3L and K3L (inhibitors of PKR and the 2-5A systems), may interfere with the induction of the antiviral state. Vaccinia infection led to delayed apoptosis in DCs, the effect more evident and extensive in immature than mature DCs (Fig. 1⇑ and data not shown). The delay may be due to the production of apoptosis inhibitors, e.g., SP-2 (39, 40). Mature DCs may be more resistant to vaccinia’s apoptotic effect possibly because of higher levels of PKR and 2-5A that inhibit the synthesis of proapoptotic products, e.g., dsRNA (Fig. 3⇑ and Refs. 36, 37, 41). Furthermore, maturation stimuli such as TNF-α (a component of MCM) or CD40 ligand promote viability of DCs via up-regulation of antiapoptotic proteins, e.g., Bcl-xL (42, 43, 44, 45). There is evidence that DCs are important in generating an immune response against poxviruses in vivo. In a mouse tumor model, only recombinant vaccinia vectors expressing a tumor-associated Ag under early promoters were capable of inducing protective and therapeutic immune responses (23). In functional assays, murine DCs infected with vaccinia-encoding Ag regulated by an early promoter activated Ag-specific CTL, while vaccinia vectors with late promoter-regulated genes did not. The recruitment of high numbers of DCs to the orf poxvirus skin lesion has also been described (30). Because DCs are the main initiators of immune responses and vaccinia inhibits their maturation, one important question is how the anti-vaccinia response is generated. One possibility is that sufficient numbers of DCs survive vaccinia infection to initiate T cell responses. Alternatively, DCs may mature in vivo before infection. Poxvirus infections can induce the rapid and systemic release of IL-1β, IFN-α, GM-CSF, and TNF-α (4, 5, 30), all of which could affect the maturation of DCs from precursors (12, 13, 16, 29). As shown in this study, a significant fraction of mature DCs can be infected with vaccinia (Fig. 5⇑A). These cells are far more resistant to apoptosis induced by vaccinia, and retain the capacity to stimulate significant T cell responses (Fig. 6⇑ and Ref. 46). Another mechanism by which the anti-vaccinia response may be generated is through cross-presentation. Bystander DCs may ingest vaccinia-infected apoptotic cells and present viral antigenic epitopes to T cells. We have demonstrated that DCs phagocytose influenza virus-infected apoptotic cells and cross-present influenza Ags to CD8+ T cells (47, 48). This pathway of representing Ags is highly efficient and may be the in vitro equivalent of the in vivo phenomenon of cross-priming. Further studies along these lines will be necessary to fathom how immunity to vaccinia is generated. We thank Alan Schmaljohn for kindly providing the Abs against vaccinia proteins, Matthew Albert and Regis Josien for advice and suggestions, Judy Adams for graphics, and Marina Lee for technical support. ↵1 M.L. was supported by Grant K98-99PK-12334-02 from the Swedish Medical Council. This work was supported by Grants AI-3916 and AI-44628 to N.B. ↵3 Abbreviations used in this paper: DC, dendritic cell; B-LCL, B-lymphoblastoid cell line; LAMP, lysosome-associated membrane protein; MCM, monocyte-conditioned medium; MOI, multiplicity of infection; PI, propidium iodide; PKR, dsRNA-activated protein kinase. Moss, B. 1996. Poxviridae: the viruses and their replication. In Fields Virology, 3rd Ed. B. N. Fields, D. M. Knipe, and P. M. Howley, eds. Lippincott-Raven, Philadelphia, p. 2637.